CEO of the Leeuwin Ocean Adventure Foundation Anne-Marie Archer,Malcolm and Tonya McCusker (McCucker Charitable Foundation) and volunteers Daniel Ryan (Hamilton Hill),Erika Delemarre (Beaconsfield),Woodren Bourne (Palmyra),Slaven Roje (Mosman Park) Alison Coumbe (Bradham) and Nora Kajamaa (lives on ship). The Leeuwin Ocean Adventure Foundation has joined with The McCusker Charitable Foundation to create the inaugural Leeuwin Uni Challenge, a chance for 40 students to receive a scholarship, worth $1800, towards a seven-day voyage along the WA coast on the STS Leeuwin II. The partnership will also enable high-profile West Australians to talk to the winners. Leeuwin Ocean Adventure chief executive Anne-Marie Archer said they were grateful for the support of the foundation. ‘The chance to sail on the Leeuwin is an opportunity of a lifetime,’ she said. The uni challenge will run from November 24 to 30. 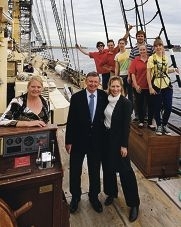 Young people aged 18 to 25 are eligible to apply at www.sailleeuwin.com before October 15.